Electric power in Bosnia and Herzegovina has been produced and used for more than 115 years. 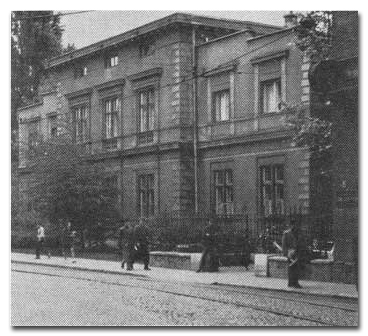 The first power station was built in 1888 next to the coal mines in Zenica, seven years after the first power plant in the world was built and put into operation in New York in 1881. Due to poor economic development, the process of electrification in Bosnia and Herzegovina was slower than the electrification of developed European countries. By the end of 1919, only 1.1% of the settlements were electrified in Bosnia and Herzegovina. In 1945, 16% of the settlements had electricity, and in 1980, 93% of the populated areas were electrified. Electric power production in 1945 reached 65 million kWh. In 1992, production was 13.7 billion kWh, and in 2002, 10.8 billion kWh was produced. The electric power consumption in 1945 was 55 million kWh, in 1991, 10.6 billion kWh, and in 2002, 9.8 billion kWh. Along with the electrification of Bosnia and Herzegovina and the increasing use of electricity, the need to connect power stations and the centers of consumption of electric power by transmission network arose. The capacity and voltage level of facilities and plants for transmission and transformation of electric power were increased. Important 5 kV, 6 kV and 10 kV overhead lines for the transmission of electric power in Bosnia and Herzegovina were built in early 20-ies of the last century. The first 10 kV overhead lines were built between Sarajevo - Ilidža and PP Kreka - Tuzla. Furthermore, the dynamic of the construction of the first lines of higher voltage levels in Bosnia and Herzegovina was as shown in the table below. Phase one: From 1920 to 1948, facilities and plants at 5 kV, 6 kV, 10 kV, 30 kV and 35 kV were used for the transmission of electric power. These were mainly unconnected facilities that were used for the transmission of electric power within the area of regional electrification. Phase two: From 1948 to 1958, 35 and 110 kV transmission networks were used for the transmission of electric power. At that stage, the expansion and connection of the areas of regional electrification within the transmission network was intensified. Power stations were connected and the usage of their capacities were synchronised. The technical conditions for the reliable supply of the centers of electric power consumption were created throughout Bosnia and Herzegovina, and the electric power system of Bosnia and Herzegovina was formed. 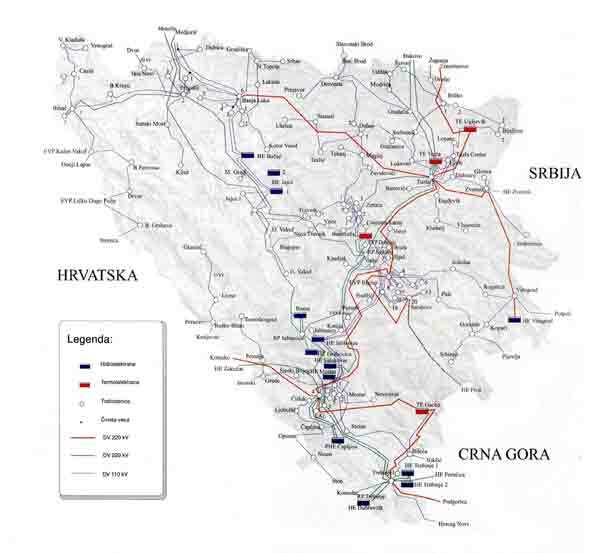 Phase three: From 1958 to 1976, the transmission network in Bosnia and Herzegovina consisted of 110 and 220 kV facilities. Overhead lines and substations were built by the adopted unified technical concept and requirements of their operation in the power system of Bosnia and Herzegovina. 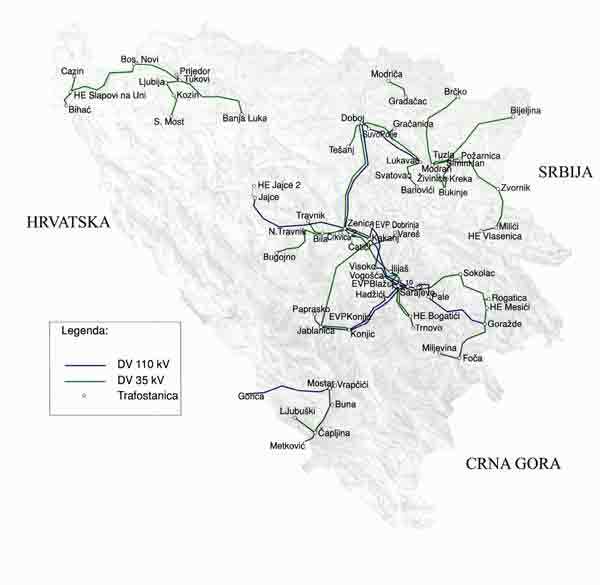 The connection to the power lines of other electric power systems in the former Yugoslavia was in progress and the technical conditions for the reliable transmission, required import, transit and export of electric power were being created. Phase four: From 1976 to 2002, the transmission network in Bosnia and Herzegovina consisted of 110 kV, 220 kV and 400 kV facilities. 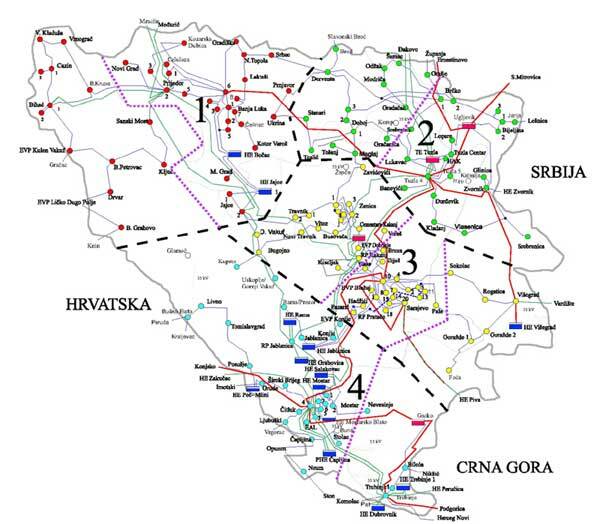 These networks were built by the adopted unified technical concept and requirements of Bosnia and Herzegovina electric power system. Modern power, protective, measuring, signal, telecommunication and other equipment were installed in the transmission facilities and plants. Required experts were trained and all other conditions necessary for the successful operation of the transmission network in the power system of Bosnia and Herzegovina were created. Transmission of electric power in Bosnia and Herzegovina was formed as a separate electric power activity in the mid 50s of last century. 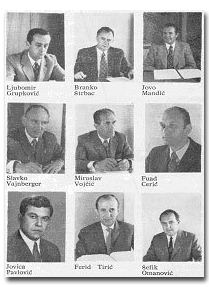 On 17 June 1953, the Executive Council of the People's Republic of Bosnia and Herzegovina made the decision to establish Electric Power Company "Elektroprenos" for electric power transmission with its head office in Sarajevo. It dealt with the transmission of electric power and design, construction, maintenance and improvement of the transmission network in Bosnia and Herzegovina. The separate price of electric power transmission was determined for the first time when "Elektroprenos" began to work and the transmission of electric power was defined as a separate electric power industry. First director of "Elektroprenos" – Sarajevo was Vladimir Langhofer, B.Sc. in electrical engineering. The first major core of 110 kV network in Bosnia and Herzegovina was formed in 1954. It consisted of 480 km long 110 kV overhead lines network and five 110/35 kV substations. HPP Jablanica , HPP Jajce I , Jajce II , TPP Kakanj and TPP Zenica were interconnected by constructing these overhead lines and substations. Large regional electric power networks of the Central Bosnia (Sarajevo, Zenica, Travnik, Kakanj, Bugojno, Jajce, Gorazde, Foca ...), Northeast Bosnia ( Tuzla, Doboj, Brcko, Bijeljina, Zvornik, Vlasenica . .. ) and Herzegovina ( Mostar, Capljina, Jablanica, ... ) merged into a single functional unit. Newly constructed public head offices of HPP Bogatici, HPP Mesici , HPP Vlasenica, TPP Banovici and industrial power plants in Blazuj, Lukavac, Foca, Bosanski Brod and Maglaj operated as parts of these regional electric power networks. The united functioning of these connected power plants and networks was enabled by the construction and operation of the dispatching center. And so, the electric power system of Bosnia and Herzegovina began to successfully operate in 1954. Table 1:The development of electric power transmission network in Bosnia and Herzegovina from 1954 to 2002. During the war in Bosnia and Herzegovina, from 1992 to 1995, there was a large-scale damage and destruction of buildings and facilities of the transmission network. Therefore, it was necessary to put a lot of work and invest a significant amount of money into its recovery and revitalization. However, one part of the capacity of the transmission network has not been restored and put into use yet. The distribution of overhead lines and substations in the transmission network in 2006 is shown on the map of the electric power system in Bosnia and Herzegovina. The most intensive investments in the transmission network of Bosnia and Herzegovina were in the period from 1975 until 1983 when the well-known program for the construction of 400 kV network was realized. The organization of electric power transmission in Bosnia and Herzegovina was changing along with changes in the economic system and the development of the electric power industry. By the end of 2002, there were three Elektroprijenos companies - "Elektroprijenos" Sarajevo, company for generation, transmission and distribution of electric power as a part of "Elektroprivreda Bosne i Hercegovine" Sarajevo; "Elektroprenos" Banja Luka – State company for the transmission of electric power within the state public parent company for the generation, transmission and distribution of electric power, and "Elektroprijenos" Mostar as a part of the public company for the generation, transmission and distribution of electric power "Elektroprivreda Herceg - Bosne "Mostar. The Law on Transmission, Regulator and System Operator in Bosnia and Herzegovina was passed in 2002 and it created conditions necessary for the establishment of a single company for the transmission of electric power, which was done in 2004 by the Law Establishing the Company for the Transmission of Electric Power in Bosnia and Herzegovina. 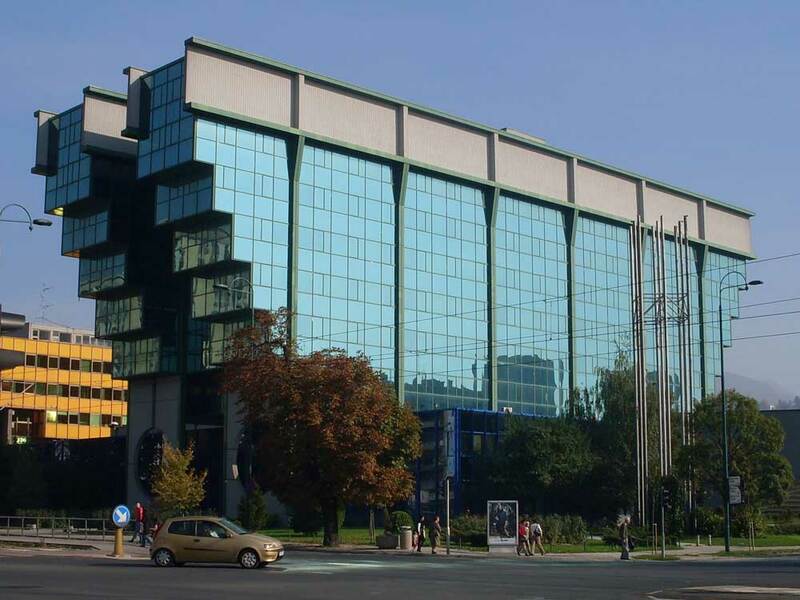 As the result, Elektroprenos-Elektroprijenos BiH a.d. Banja Luka, with its head office in Banja Luka, was registered with the Ministry of Justice of Bosnia and Herzegovina on 1 February 2006, Decision number 08-50.3.-01-4/06, and began to work. The goal of organizing a single company for transmission of electric power is to create the conditions for the functioning and development of the electric power market and stable and rational transmission of electric power in Bosnia and Herzegovina. 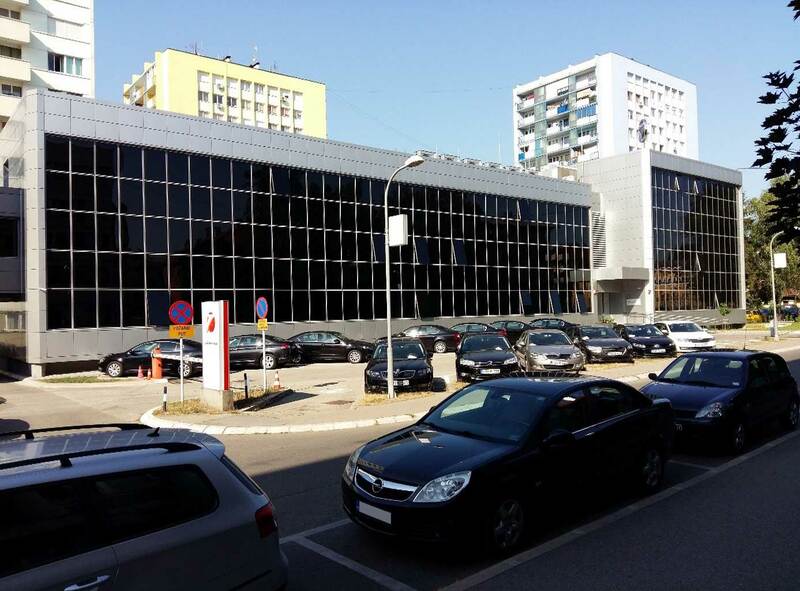 Elektroprenos Management head office in Banja Luka since 2006.